Senators Jim Holzapfel (R-10) and Joe Kyrillos (R-13) criticized President Obama’s reported announcement that $1 billion in remaining Superstorm Sandy relief funding will be dolled out to other states in a national resiliency competition. Senators Holzapfel and Kyrillos introduced legislation in April urging the United States Congress to prohibit the federal Department of Housing and Urban Development (HUD) from diverting remaining Sandy aid funding to projects in other parts of the country. Republican legislators representing Jersey Shore communities impacted by Superstorm Sandy will introduce resolutions in both houses of the Legislature urging the United States Congress to block a reported effort by the federal Department of Housing and Urban Development (HUD) to divert more than $1 billion from remaining Sandy aid funding to projects in other parts of the country. The resolutions will be introduced by Senator Jim Holzapfel and Assemblyman Greg McGuckin, both of the 10th District. Senators Joe Kyrillos (R-13), Jennifer Beck (R-11), Robert Singer (R-30) and Christopher Connors (R-9) will join as co-sponsors of the Senate Resolution. Assembly members Dave Wolfe (R-10), Brian Rumpf (R-9), DiAnne Gove (R-9) and Declan O’Scanlon (R-13) will join as co-sponsors of the Assembly resolution. After fighting for a year in opposition to a $31 million rate increase proposed by JCP&L, Senator Jim Holzapfel, Assemblyman Dave Wolfe and Assemblyman Greg McGuckin said that it now appears likely that the increase will be denied and rates may even be lowered for the utility’s customers throughout New Jersey. Legislation sponsored by Senator Jim Holzapfel (R-10) which establishes criminal penalties for leaving the scene of a boating accident was passed by the State Senate. “Safety is always our first concern with more boaters on our waterways each year. This legislation will give law enforcement the authority needed to persecute those reckless enough to leave the scene of an accident without assisting the passengers of the other vessel.” said Senator Holzapfel. The legislation, S-2859, is modeled after current motor vehicle law, which makes it a second degree crime to leave the scene of a motor vehicle accident that results in the death of a passenger, and a third degree crime when the accident results in serious bodily injury. A resolution sponsored by Senator Jim Holzapfel (R-10) that seeks to expand air service to Atlantic City and surrounding attractions through the recruitment of new carriers to Atlantic City Airport was approved by the Senate Transportation Committee. The resolution, SR-75, urges the South Jersey Transportation Authority (SJTA), the owner of the airport, and the Port Authority of New York and New Jersey (PANYNJ), the manager of the airport, to identify and recruit additional airlines to the airport. A bill that would require mortgage creditors to maintain and pay the expenses of homes in foreclosure in senior communities has passed in the Assembly Housing and Local Government Committee. The bill, A-4169/S-2806, was introduced by 10th District Legislators, Senator Jim Holzapfel and Assemblymen Dave Wolfe and Greg McGuckin in response to senior residents who are bearing the financial burden of foreclosed homes in their retirement communities. 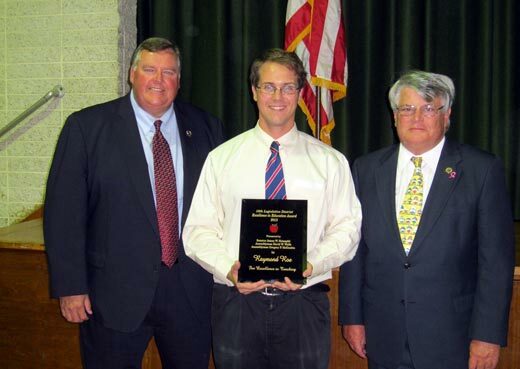 Senator Jim Holzapfel and Assemblymen Dave Wolfe and Greg McGuckin of the 10th Legislative District presented the 14th Annual “Excellence in Education Award” during a ceremony at the Walnut Street Elementary School in Toms River to second grade teacher, Raymond Roe. “Mr. Roe has established an admirable reputation at Walnut Street Elementary School where he excels in classroom management and supports his students learning in an enthusiastic and creative environment. It is an honor to present the Fourteenth Annual Excellence in Education Award to such an outstanding educator,” stated Senator Holzapfel. Senator Jim Holzapfel (R-10) said that a widespread Verizon Wireless outage that began yesterday affecting many in the region underscores concerns about Verizon’s plan to discontinue traditional landline service in some 10th District communities. 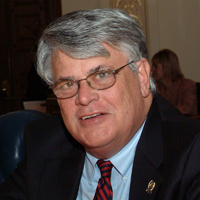 Senator Jim Holzapfel (R-10) said that the Legislature must move forward with efforts to keep loaded firearms out of the hands of unsupervised minors to prevent future tragedies like those experienced in Newtown and Toms River recently. 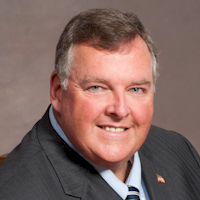 The Senator’s comments followed reports that no additional votes are planned on legislation (S-2723) sponsored by Senate President Stephen Sweeney to concur with recommendations proposed by Governor Chris Christie in a conditional veto of the legislation. Earlier this year, residents in Mantoloking, Bay Head and part of Brick Twp. were informed by Verizon that their traditional land-line phone connection was being discontinued and customers would be required to use its new wireless alternative called Voice Link. The company explained that the copper wiring damaged by Super Storm Sandy was too costly to replace. Last week, Verizon reversed a similar stance it had taken with residents of Fire Island, N.Y. after receiving negative feedback from the community. Sen. Jim Holzapfel and Assemblymen Dave Wolfe and Greg McGuckin do not agree with the company’s change of position for Fire Island but not for these affected towns in New Jersey. In a letter to the Board of Public Utilities, the District 10 legislators asked the BPU to look into the matter as well as explore the option of requiring Verizon to wire these communities with fiber optics in order to ensure that all residents have adequate telephone services.